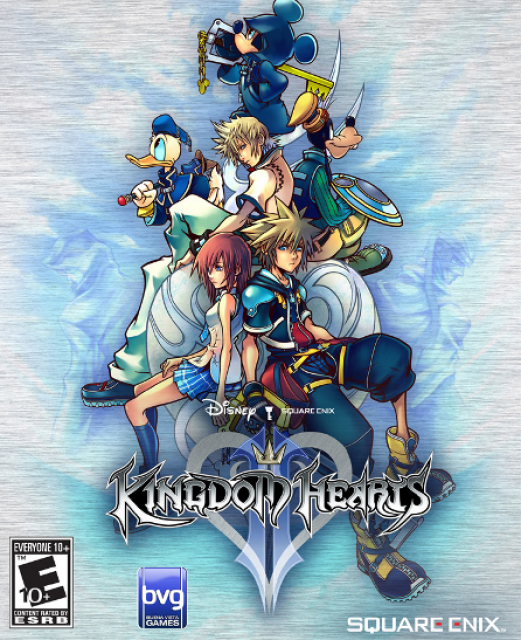 The third installment in the Kingdom Hearts franchise following after Kingdom Hearts: Chain of Memories, known for its successful combination of Disney and Final Fantasy franchises into a believable plot. Kingdom Hearts II is the sequel to the 2002 hit action-RPG Kingdom Hearts and, just like it's predecessor, combines Disney characters and worlds along with several Final Fantasy characters into a single universe. It was developed by Square Enix and published by Buena Vista Games. Don't get too attached to Roxas here; the game is still Sora's show. The story of Kingdom Hearts II starts directly after the events of Chain of Memories and features a new playable character, Roxas, for its tutorial levels, focusing the story on Roxas' quest to discover who he is and where he comes from. After the tutorial, the player is put back in control of Sora as they learn about a new threat, the Nobodies. These creatures are the empty bodies of those who have been turned into Heartless. Those who are especially strong willed keep their human form and have formed their own ruling body called Organization XIII. Throughout the game Sora and company run into many different notable Disney and Final Fantasy characters in their quest to find Kairi and Riku, defeat the Heartless and find out the truth about Organization XIII, which ultimately ends in a final confrontation with the Organization's leader. The gameplay is similar to the Original game. Like the original Kingdom Hearts, this game is an action RPG relying heavily on button mashing to create combos in order to defeat the numerous enemies surrounding Sora. Kingdom Hearts II adds the usage of the triangle button in order to perform finishing combos on enemies. Magic is still a major factor in combat and Limits with another party member have been added. Also new to the series are Drives, which allow Sora to merge with one or more party members to gain additional abilities and increased strength, magic, or both. Leveling still induces stat increases and the learning of new abilities and the use of armor, accessories and item synthesis have been more pronounced with the Moogle shops in each world. Minigames are also more numerous with skateboarding among other challenges. Sora as the player will come to know him. Sora's outfit changes (as seen above). Sora wields an additional keyblade (the player selects which additional keyblade he uses). More attacks in each combo. Sora can give damage to Goofy instead of himself. Sora can jump much higher than before. As Sora has to merge with Goofy to shift into Valor form, he is no longer in the party. Sora is unable to use magic. Valor Form gains one experience point for every hit caused on the enemy. As this form levels up Sora gains the High Jump ability to use outside of battle. Sora changes costume (as seen above). Sora's Keyblade length increases, although he does not use it to attack. The command menu changes from "Attack" to "Shoot". Instead of running, Sora glides along the floor. Different Magic attacks can be combined to make bigger combos. Magic can be used in rapid succession. Sora can now dash quickly along the ground (by Pressing "Square"). As Sora must merge with Donald to shift forms, he is no longer in the party. Wisdom Form gains one experience point for every Heartless Sora defeats in this form. As the form levels up Sora gains the ability to use dash outside of using Wisdom Form. Sora doesn't physically control both of the Keyblades, instead controlling one with random magic Sora uses. Jump higher and run faster. Sora can perform a dodge in mid-air. Although Sora is significantly more powerful in this form, he must merge with both supporting characters to shift into this form. Master form gains one experience point for every small drive orb collected in this form and three for every large drive orb. As Master Form levels up Sora gains the ability to use the Aerial Dodge move outside of using Master Form. Sora wields two levitating keyblades. Sora has the ability to glide quickly across the ground. Sora can glide through the air (by Pressing "Square"). Sora must also merge with both supporting characters to shift into Final Form. Final Form gains one experience point for every Nobody Sora kills in this form. As Final form levels up Sora gains the ability to glide outside of using Final form. Sora can learn Final Form after the encounter with Roxas in The World That Never Was. After that even Sora has a chance of going into Final Form every time he uses a drive form. Another form, called Anti-form Sora. Anti-form Sora is Sora's Heartless Drive and appears based on a hidden counter that increases as he uses forms. The counter starts at zero and goes up by one every time Sora changes form and does not go into Anti Form. The counter goes down by ten every time he does and is reset to zero every time he learns a new form. Going into Final Form decreases the counter by ten. The higher the counter is the greater the chance Sora has of going to Anti Form. The counter is temporarily multiplied during certain boss fights and greatly increases when fighting a member of the Organization. Sora turns into a heartless. Sora loses his keyblade and fights with his limbs. Donald and Goofy merge with Sora and are no longer in the party. "Attack" is the only option on the command menu. Although Sora is significantly faster and attacks faster, his attacks are now much weaker. Cannot revert back to normal form until the drive gauge is completely depleted. Like in Kingdom Hearts, Sora may summon Disney characters to aid him in battle. In Kingdom Hearts II there are four summons, two less then the original Kingdom Hearts. Only Genie returns as a summon from the first Kingdom Hearts, however Tinker Bell accompanies Peter Pan who is a summon in Kingdom Hearts II. As for the rest, Mushu and Simba are now characters on other worlds (while Simba is actually a party member in the Pride Lands) and Bambie and Dumbo are nowhere to be found. As summons use the Drive Gauge instead of the Magic in this game, Sora cannot change forms and summon at the same time. The summon will replace the two party members in battle with Sora. If Sora is by himself or with only one Party member he can not summon (unless in certain Underdrome tournaments). Instead of the summoned character being limited to only one action, the summoned characters now have a menu of multiple actions, some solo and some cooperative with Sora. Chicken Little is the main character of Chicken Little. When summoned, Chicken Little shoots baseballs and firecrackers at enemies when on the field. His attack with Sora, called FPS, is, obviously, a first person shooter like mode where Chicken can throw eggs and firecrackers in rapid fire from a first person view. He also has other abilities, such as healing Sora when damage is dealt to enemies. Genie is the magical being from the Agrabah. Genie attacks with a funny, magic lamp themed keyblade, and mimics any one of Sora's drive forms (Valor, Wisdom, and Master. No Final). Once in that form, Genie may use one of four limits. He uses Sonic Rave for Valor, Strike Raid for Wisdom, Final Arcana for Master, and Infinity for when not in a form. He will also randomly heal 40% of Sora's health with healing herbs. Stitch is the the alien pet in Lilo and Stitch. He will climb around the the menu screens as well as the T.V. screen itself! Stitch will protect Sora by shooting emeries before they get to close to him and play a ukulele to stun enemies. His team attack with Sora called Ohana, where Sora and Stitch jump on the screen and use a barrage enemies with a combination of ukulele and plasma attacks. He also constantly heals Sora's MP and HP bars throughout the battle. Peter Pan is the main protagonist for Neverland. Peter comes with Tinker Bell, who was a summon by herself in the first Kingdom Hearts, while Peter was a temporary party member, and flies around attacking with a dagger, as he did in the first game. Tinker Bell constantly heals Sora at the same time, which she also did as a lone summon. Also, Tinker Bell will revive Sora once in battle if all his health is lost. His team attack with Sora is cinematic, as Sora will be reminded of his adventures in Neverland in the first game (with pictures floating across the screen) while Pan and Sora fly around hitting anything in their path. While the PS2 version of II's Final Mix was exclusive to Japan, it will be included in Kingdom Hearts HD 2.5 Remix (alongside Kingdom Hearts: Birth by Sleep Final Mix and remade cutscenes from Kingdom Hearts Re: Coded) for Playstation 3, which will be released in the west as well as Japan. Like many other enhanced versions of Square Enix games, Kingdom Hearts II: Final Mix features English voices and Japanese text, whereas the original game was entirely in Japanese. Because of the complications of re-hiring the English voice actors, newly added cutscenes were left voiceless during the course of game. They are, however, viewable in Japanese if the player beats the game with a Kingdom Hearts: Re:Chain of Memories clear data savefile on their memory card. Doing so will unlock a Theater Mode option on the menu screen, where all old cutscenes can be viewed in both English and Japanese, and new cutscenes only being viewable in Japanese. Many new bosses were added. During the course of the game, the player can find a total of four shields in various areas representing Organization XIII members who were killed in Kingdom Hearts: Chain of Memories. If the player examines a shield, they will be transported to an arena where they will be able to fight a deceased Organization XIII member. A battle with Roxas in one of the final areas of the game, which was previously only a cutscene, was now made playable too. A whole new area called Cavern of Remembrance was added to the game, and is accesible from Hollow Bastion. In this cave, the player must use their Drive Forms to the fullest to reach the end, where they will be able to fight powered-up digital copies of all thirteen Organization XIII members. If all Organization XIII members are defeated when the game is beaten, the player will be able to fight an unknown armored knight, later revealed by Tetsuya Nomura to be Terra, by entering a black hole behind the Cornerstone of Light in Disney Castle. If the player beats the game again after beating the knight, they will be treated to a new secret trailer eluding to the events in the upcoming PSP game Kingdom Hearts: Birth by Sleep. A very popular new addition was a fourth difficulty mode called Crticial Mode. In this mode, the player's maximum stats are decreases significantly, which in most cases means the player can only take one or two hits from a boss before dying. However, if the player still finds the game too easy, there is a new equipabble ablility exclusive to Critical Mode called "EXP0". When equipped, it stops the player from gaining any experience points, thus making it possible to beat the game with a level 1 character. The player still gains stats upgrades through beating bosses, however, as beating the game with a true level 1 character would be deemed impossible. A new Drive Form called Limit Form was added. It's the only Drive Form which Sora can use without fusing with any of his party members. Its appearance resembles Sora's outfit in Kingdom Hearts, which directly ties in with its abilities. When using this form, the Magic menu will change into the Limit menu, which contains many of Sora's attacks from previous games, all for which he will recieve some health when using them. The Form's growth ability is Dodge Roll, a very useful ability in the previous games that was cut out/replaced with Quick Run in Kingdom Hearts II. Two new keyblades can be found in this game. The "Two Across" keyblade is recieved when beating Roxas in The World That Never Was, and is unmissable. The other keyblade called "Winner's Proof" is recieved when all Organization XIII Mushroom Heartless have been defeated, that are scattered all over the game and must be killed in special ways. The Gathering is the secret video at the end of Kingdom Hearts II. It is a teaser for the up coming Kingdom Hearts game for the PSP, Birth by Sleep. A longer version can be found at the end of Kingdom Hearts 2: Final Mix . The video can be seen by either beating the game on proud difficulty or unlocking everything on the medium difficulty. Continuing with the first game, the soundtrack of Kingdom Hearts 2 was arranged by Yoko Shimomura. The original pieces were composed by Shimomura, while the opening orchestration and end credits were composed and conducted by Kaoru Wada and performed by the Tokyo Philharmonic Orchestra. Also of note is the original vocal theme entitled Passion, which was written and performed by Utada Hikaru. In the Western versions of the soundtrack the English version of 'Passion,' 'Sanctuary,' is used. Several new tracks were composed by the series' composer Yoko Shimomura to complement the new areas and bosses in the Final Mix version of the game. They can be found on the ninth and final disc of the Kingdom Hearts Original Soundtrack Complete.